On 4 May, Dusseldorf hosts one of the most awaited exhibitions of the year, Interpack 2017, with Uflex’s global film manufacturing arm Flex Films preparing to showcase its products in the art and science of converting. Flex Films will be exhibiting its myriad innovations in the field of film manufacturing that is expected to evoke a lot of interest among the global converting fraternity. Flex Films’ pavilion (Hall No. 10; Stand No. D-44) at the mega event will have six distinct zones showcasing various films / substrates and value added products that have created ripples in the arena of converting. These six zones are sustainability, speciality, lidding, barrier, PP (OPP and CPP) family, and aesthetics and anti-counterfeiting. Here’s a quick run-down on the products one can see from the house of Flex Films at Interpack 2017. Sustainability: Being the cornerstone of its business strategy, Sustainability holds a special place in all business operations of Flex Films. Strong emphasis is laid on fostering down-gauging, light-weighting, reduction at source and design optimisation in all its creations. Some of the major highlights of this zone will be recycled polyester film; oxo and bio degradable films, and green polyester film (green PET) among others. In green PET film, conventional ono ethylene glycol (MEG) that is made from non-renewable petro-based feedstock is totally replaced by green MEG derived from bio-ethanol made from renewable agro inputs. This film has been internationally honoured for its sustainability quotient. Speciality: In this section, visitors will be able to see latest innovations such as Twist (TST), Shrink (SPH), Easy Stackable (ESB), Digital Printing (PDP), UV Curable (UVC), Electronic Goods Wrapping (MTG-AS-B/M) Film, special polyester film for Alu-Alu pharma laminate; and Easy Tear (IET) films. While Twist (TST) film exhibits high mechanical properties and excellent twist retention, Easy Stackable (ESB) Film is specially modified on one side to prevent slippage during storage and palletisation. The UV Curable (UVC) film is suitable for direct UV offset printing without requiring any primer/ treatment. Digital Printing (PDP) Polyester Film is HP Indigo certified substrate suitable for direct printing without requiring any priming or coating. Electronic Goods (MTG-AS-B/M) Film is metallised on one side and primed with a special material on the other for controlling static charges thereby making it suitable to run on high speed converting machines and wrapping electronic goods. One of the much sought after substrates that will be on display at Interpack this time around is a special polyester film that has successfully replaced BOPA and PVC substrates from a typical Alu-Alu laminate used in pharma packaging, serving as a game-changer. Flex Films shall also exhibit easy tear (IET) polyester film that is used for pharma strip packaging by laminating with down-gauged aluminium foil. Lidding: Opening lids of disposable glasses, cups and platter meals can pose a serious challenge particularly for the ever increasing aging population. To address this, Flex Films has engineered suitable substrates that pave way for smooth and easy lid-opening. In the lidding section at Interpack the company will be displaying Isotropic (IST) and Peelable (TPA) Films among several others. Isotropic (IST) films are polyester substrates having balanced properties that ensure that the film does not tear abruptly. Peelable polyester films are heat-sealable lacquered on one side. This film offers high level of convenience in lid opening and serves as a ready to use lidding solution for the convertors. Dairy packaging film (DPA), also from the polyester family exhibiting excellent machinability and dimensional stability will be seen at Flex Films’ stand. Barrier: One of the most important purposes that laminates comprising different substrates serve is to provide optimum barrier properties to protect the product from being spoiled through its recommended shelf-life. Flex Films has made substantive headway in engineering high-barrier substrates. Some of these that can be seen at Interpack this time around are AlOx (PLX & PGX); Bag in Box (LBP-M); High-Barrier MET PET (EBP-M) and Super Barrier Corona (PGB) Films among several others. Notably AlOx (PGX) Polyester Film is the thinnest PET AlOx film available globally. Despite being the leanest, the 9.5µ AlOx polyester film exhibits excellent barrier for oxygen and water vapour as WVTR (gm/m²/day) and O.T.R (cc/m²/day) are both < 1.0. No player other than flex films offers such a thin PET AlOx speciality film with such superior barrier properties. Super Barrier Polyester (PGB) Polyester Film with specially modified surface treatment (on one side) offers very high-barrier to oxygen. The other side of the film can be corona treated or left untreated as per the requirements of the convertor. The oxygen transmission rate (OTR) of this film is <6cm³/m²/day at 23°C and 0% RH. A big advantage of this film is the fact that it does not require any coating or co-extrusion of polyvinylidene chloride (PVDC) or ethylene vinyl alcohol (EVOH) for enhancing barrier properties. Bag in Box (LBP-M) is a metallised polyester film with high oxygen barrier <0.8cm³/m²/day at 23°C and 0% RH with both surfaces exhibiting exemplarily high lamination bond strength with PE. PP (OPP and CPP) family: Flex Films also manufactures different variants of oriented polypropylene and cast polypropylene films. Some of these films that will be on display at Interpack are: ultra-barrier OPP (TUB-M), low SIT (TLS), anti-fog OPP (TAF); retortable CPP (CPR); deep freeze CPP (CDF) and high-barrier CPP (C-CXB-PZ-M) films. Ultra-barrier OPP (TUB-M) is a metallised BOPP film that is heat-sealable and demonstrates superior barrier and broad seal performance. This film finds use in manufacturing flexible packaging material for biscuits and cookies. Low SIT (TLS) is a transparent BOPP film with one side treated and the other side having low seal initiation (SIT) temperature. It offers excellent hot tack strength and high seal integrity. Anti-fog OPP (TAF) is a transparent film where both the sides are treated and sealable. As the name suggests, one side of the film exhibits anti-fog properties. This film finds wide application in making packaging material for fresh food, vegetables and meat. The film ensures that the droplets of water are not coalesced on the interior of the pack. This prevents the transparent pack from being fogged out. The root cause of water droplet formation is the difference in surface tension between the film and the water. The anti-fog film is made from of polar (hydrophilic) polymer with a surface energy higher than that of water. This results in droplets forming lower contact angles with the film. These droplets tend to accumulate and form a very thin transparent film of water, reducing or even eliminating the fogging effect. High-Barrier (C-CXB-PZ-M) is a metallised CPP film with metal deposition on the corona treated surface, while the other side being sealable. This film demonstrates a broad hot tack window, excellent barrier properties and low seal initiation temperature. The film finds extensive use in manufacturing packaging material for snacks and biscuits. Aesthetics and anti-counterfeiting: The day and age we live in, threat of counterfeiting to the brands is more dreaded than ever. Also on display at Flex Films’ stand will be holographic and Fresnel lens embossed films among other brand protection solutions. Fresnel lens embossed film in particular is being manufactured at Flex Films Europa (Poland) in alliance with WaveFront Technology Inc with direct assistance and support of Uflex Limited’s Holography business back in India. Aesthetics play an undeniably important role in packaging, drawing attention of the customers at the point of sale (POS). As well as combating counterfeiting, these films also add to the aesthetic quotient of the packaging. Other pigmented special effect films from the polyester and polypropylene families in high gloss and matte variants will also be seen at Flex Films’ stall at Interpack 2017. Talking about Flex Films’ wide array of products that will be on display at Interpack 2017, Mr Anantshree Chaturvedi, vice-chairman and CEO of Flex Films International said: "In converting, everything starts with a film or substrate. Science comes alive when different substrates are carefully engineered and treated to impart desired properties in the ensuing laminate that eventually forms the packaging for a particular product. The skill and finesse that further goes into the process of converting these substrates into laminates is an art. It is this perfect interplay of art and science that brings in the much required innovation to create value added differentiation in the field of converting/packaging. I am glad that our innovative films have been adding incrementally progressive value to the businesses of convertors and brands alike across the globe. Interpack is a great platform for meeting the convertors and brands and taking them through our large and innovative assortment of films and substrates." Praising Messe Dusseldorf’s initiative of congregating all stakeholders of the converting and packaging industry under one roof, Mr Ashok Chaturvedi, chairman and managing director, Uflex Limited (parent company of Flex Films) said: "The collective wealth of experience in terms of product innovation for the converting/packaging industry that will be on display at Interpack 2017 is truly praiseworthy. 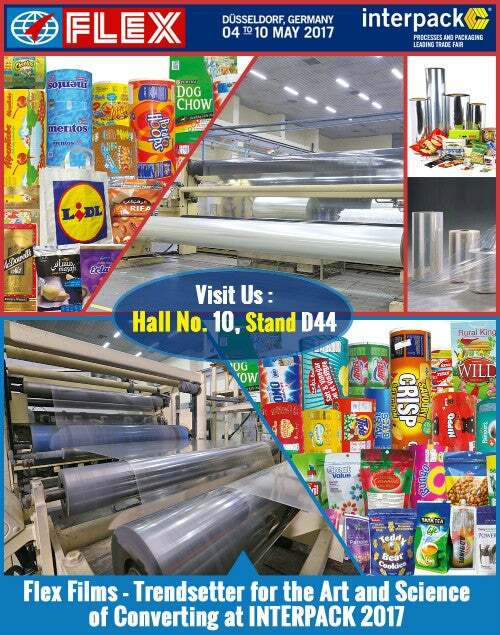 I am glad that Flex Films will be showcasing its most contemporary and innovative products for the global converting industry. After all, the art of converting starts with the science of manufacturing the film." Visit Flex Films at Interpack 2017 in Hall No. 10; Stand No. D-44 from 4-10 May 2017.